As a young aid worker, Sasha Chanoff was sent to evacuate a group of refugees from the violence-torn Congo. But when he arrived he discovered a second group. Evacuating them too could endanger the entire mission. But leaving them behind would mean their certain death. All leaders face defining moments, when values are in conflict and decisions impact lives. Why is moral courage the essential factor at such times? How do we access our own rock-bottom values, and how can we take advantage of them to make the best decisions? Through Sasha’s own extraordinary story and those of eight other brave leaders from business, government, nongovernment organizations, and the military, this book reveals five principles for confronting crucial decisions and inspires all of us to use our moral core as a lodestar for leadership. Sasha Chanoff is cofounder and executive director of RefugePoint, a humanitarian organization that finds lasting solutions for refugees. He is the winner of the Charles Bronfman Prize and the Gleitsman International Activist Award, given by the Harvard Center for Public Leadership. David Chanoff has authored or coauthored nineteen books and written for publications such as the New York Times Magazine, Washington Post, American Scholar, and American Journal of Education. David Gergen is a CNN Senior Political Analyst and has worked as an adviser to four U.S. Presidents. He is also the co-director for Center for Public Leadership at the Harvard Kennedy School. 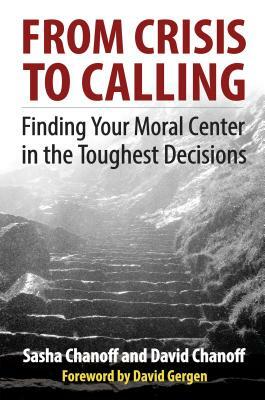 "Sasha and David Chanoff have written a powerful argument for sorting through critical moral beliefs whenever a leader is faced with a difficult decision or crisis. Although the book begins with Sasha&apos;s experiences while in Congo, his path to reach the right decision is also compelling to me and my colleagues in Silicon Valley. Though delivered by a renowned expert in refugee affairs, these lessons are useful in all walks of life. On top of everything else, the book is gripping to read and an exciting page turner."